The Packard Car is Free!! So for those of you who have not seen any of my posts about the renovations to Packard Lab Lobby (or have not seen the lobby for yourself) I am here to show you what it has now become. Below are some of the pictures that I have taken showing the renovations to the lobby. There are two big changes that took place over Spring Break. 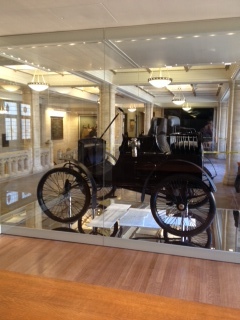 One of the biggest changes is that they moved the car from its old case right in the center of the lobby to a new case on the right of the lobby. Way back before the changes happened to the lobby, the car was hidden behind some screens and you could not see all of it. Now it is out in the open and you can view its full glory. 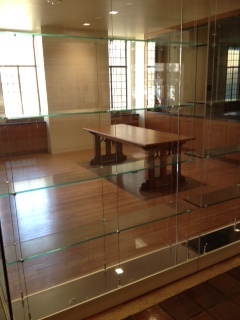 The other big change is that they removed all of the plastic and wood covering the new glass room. 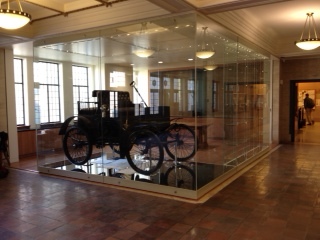 The room has some glass shelves on one side of it and has the Packard Lab car on the other side (besides the walls of the building). The last picture is a panorama showing a view of the new room from the back corner. Surprisingly enough there is still caution tape up. Which makes me think that there will be even more changes to the lobby to come. We will have to wait and see. This entry was posted in Uncategorized and tagged Packard Lab, Packard Lab Lobby. Bookmark the permalink.